Made in Australia, with eucalyptus fibre-rich materials, Bambi's Eco Renew Eucalyptus Pillow offers natural bedding comfort, while using natural, renewable resources. It's hypoallergenic, so its suitable for allergy sufferers, and is contained within a tencel cover that is both soft and luxurious. You'll no longer have to count sheep to drift into the land of nod, thanks to Bambi. You won’t just fall asleep. You’ll fall in love – with Bambi. 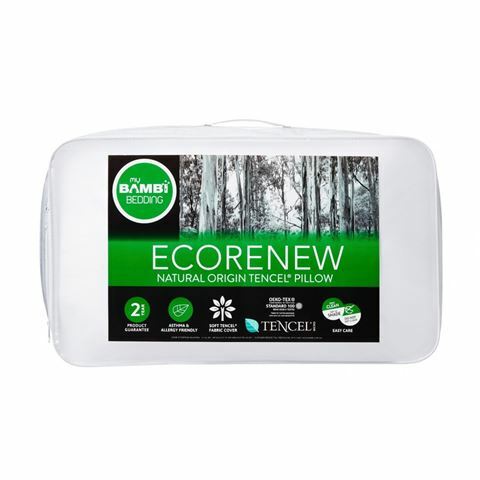 Made from tencel, plant fibre and polyester with a tencel cover. Presented in a plastic zippered case with handles, for hygienic storage and portability. Dimensions: 63cm (l) x 37cm (h) x 15cm (w).